Angels and Patriots Book One has been honored! I’m thrilled to share that my historical fantasy novel Angels and Patriots Book One has won it’s seventh and eighth award! New York City Big Book Awards honored my novel as winner of the Military Fiction category and distinguished favorite in the Historical Fiction category. This wonderful announcement came just after I released the second book in the series, Angels and Patriots Book Two, to my developmental editor. I couldn’t have achieved this accomplishment without the editing skills, graphic design, and guidance from the ladies at Author’s Assistant. Thank you. Nor could I have accomplished this without the incredible patience of my husband, John. He spent countless days and weeks alone while I conducted extensive research on the events that ignited and occurred during the first days of the Revolutionary War, patriots, loyalists, politics, colonial life, Founding Fathers and Mothers, the British army, and religious references to the fallen angels who created the forbidden Nephilim, not to mention the hundreds of hours it took to write the novel. John patiently allowed me to take him to Boston and Roxbury for a seven day pilgrimage honoring the life of patriot, Son of Liberty, and Founding Father, Dr. Joseph Warren; who is an important character. Without Joseph’s courage, fortitude, and popularity, the Revolutionary War may never have begun. Among Joseph’s many accomplishments, he is the young physician who sent Paul Revere on his famous midnight ride to warn the Massachusetts countryside that the British were on the move from Boston. Lastly, I would like to thank Dr. Samuel Forman, author of the biography Dr. Joseph Warren: The Boston Tea Party, Bunker Hill, and the Birth of American Liberty, for sharing his expertise and offering his support for my historical research on Warren while I wrote this book. Thank you for allowing me to share this humbling and exciting announcement! Author Salina B BakerPosted on November 11, 2018 November 12, 2018 Categories American Revolution, Angels and Patriots, Book Awards, Paul Revere, Revolutionary WarTags American History, Angels, British Army, Bunker Hill, Colonial America, fallen angels, Fantasy, Historical Fiction, Lexington and Concord, Military, Patriots, Revolutionary War, War, Writing5 Comments on Angels and Patriots Book One has been honored! Angels & Patriots: Book One has won recognition with four awards! I’ve had my nose in stacks of books, historical maps, and reliable websites so I can accurately depict the 1776 Battles of New York and the celebrations after the reading of the Declaration of Independence while writing Angels and Patriots: Book Two. 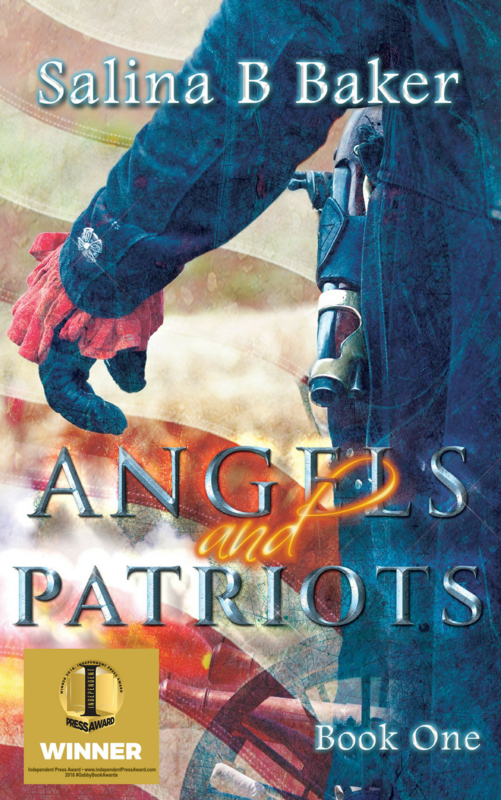 When I took my nose out of the books and from the writing screen, I was honored to find that my novel Angels and Patriots: Book One had won four awards. What an incredible spark to keep my writing going! I now feel a greater sense of the need to continue the story of archangel, Colm Bohannon, and his brotherhood of angels and their challenges as they fight in the Continental Army and support the patriotic cause of 1776. I ardently hope that Angels and Patriots: Book One will continue to be a historical source for readers who prefer fantasy/fiction and would not normally pick up a book on the American Revolution or the people who sacrificed everything for liberty. Angels and Patriots: Book Two is progressing a little bit slower than I had anticipated. This is due to the shift in the theater of war from Massachusetts to New York, a new cast of characters intermingled with those in Book One, and the angels’ changing challenges among the children of man. However, it promises to be an exciting read once it’s done! Author Salina B BakerPosted on May 23, 2018 May 24, 2018 Categories Angels and Patriots, Revolutionary WarTags American Revolution, Angels, Angels and Patriots, banished angels, Book Awards, Writing4 Comments on Angels & Patriots: Book One has won recognition with four awards!